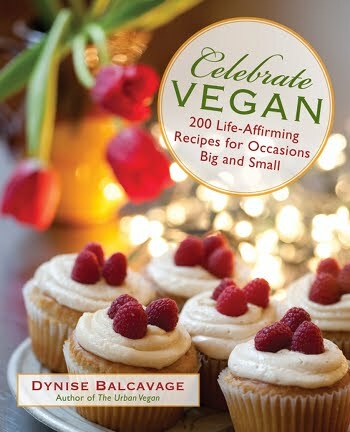 Celebrate Vegan is the second cookbook by Dynise Balcavage. Many of you know and love Dynise, from her Urban Vegan blog and first book, The Urban Vegan. Celebrate Vegan steps into just what the title suggests... party fare! It's not necessarily traditional celebrations either, like Christmas and Thanksgiving. While Dynise offers some recipes for these holidays, there is far more devoted to other less-observed religious and non-religious, international, and culturally-defined reasons to celebrate! For instance, Dynise serves up menus for St. Patrick's Day, Mother's Day (and Father's! ), Cinco De Mayo, Fourth of July, Chinese New Year, Mardi Gras, and Earth Day. Vesak, Purim, and Diwali are also covered. Don't know those holidays? Neither did I! That's what sets Dynise and her cookbooks apart. She takes you on food journeys. In this book, you can explore different cuisines based on the holidays and feasts in which they are rooted. So, even if you aren't looking for recipes to observe a particular holiday, this book gives you the opportunity to try out new dishes from other cuisines - in pure vegan form! Plus, Dynise injects fun into this book. Ladies, you can start planning your "Girls' Night In"... or "Tailgate Party", if you prefer! Some of the recipes that immediately caught my eye include "Hot-and-Sour Carrots and Lentils" (New Year's Day), "Chickpeas with Tomatoes, Eggplant, and Kale" (Eid Al-Fitr), "Tanzanian Curried Chickpea-Banana Soup" (Kwanzaa), and "Caponata" (Father's Day). And it WAS! For those of you unfamiliar with caponata, it is a Sicilian dish - a pickled, savory salad of sorts consisting of stewed eggplant, onions, peppers, celery, and then the irresistible sweet/sour/pungent blend of vinegar, raisins, capers, and olives. Reminder: Get your vegan buttocks over and "like" my new facebook page. I have giveaways coming very soon, and will be posting them there. All part of the countdown to LTEV! Stay tuned! I always find a reason to celebrate - I think I'd love this book! Thanks for the review! Wow, this book sounds great. Thanks for your recommendation. Finding a new recipe book is always a great feeling because it rewards you again and again. I love her cookbooks. After watching her make the Thai- Centric Creamy Mac on YouTube, I had to make it. It was delicious. She even has recipes for my birthday which is on Candlemas/La Chandaleur (also Groundhog's Day). They're all crepes. I can't wait to make these in two days.